The Imitation of Christ By Thomas a Kempis Book I Chapter II - Does Anders Behring Breivik Imitate Jesus Christ? The Imitation of Christ By Thomas a Kempis Book I Chapter I - Does Anders Behring Breivik Imitate Jesus Christ? This Blog Will Shame All Those In The News Media And Everyone Else Who Insists That Anders Behring Breivik Is A Christian. Then Jesus said to his disciples: If any man will come after me, let him deny himself, and take up his cross, and follow me. Mt.xvi.24. Anders Behring Breivik is not a Christian, he may call himself a Christian, and half the world may believe him to be so, but that still does not make the man a Christian. 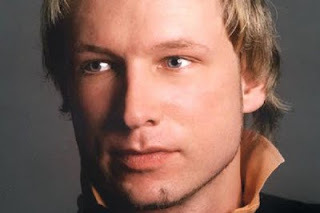 Does Anders Behring Breivik imitate the life of Jesus Christ? The answer is no. Anders Behring Breivik does not follow in the bloodied footstep of Jesus Christ. No, Anders Behring Breivik follows in the footsteps of the false prophet Muhammad. Anders Behring Breivik is a true Jihadist, he is a true follower of the demonically inspired Muhammad. This how the Muslim planned to carry out his attack on Fort Hood. This is the same modus operandi used by the Muslim Convert Anders Behring Breivik in his terrorist attack in Norway. It will soon be two days since we suffered the worst crime committed in our land since the war. On Utøya and in Oslo. It feels like an eternity. They have been hours, days, nights filled with shock , despair, anger, and tears. Today the time has come for mourning. Today we must allow ourselves to take account. To remember the dead. To mourn those who are no longer with us. Ninety-two lives have been lost, several people are still missing. Each and every life that has been lost is a tragedy. And together the number of people killed amounts to a national tragedy. Why Christian Fundamentalists Refuse To Label Anders Behring Breivik As The AntiChrist? Obama is the AntiChrist. Over the last three and half years or so, how many "Christian" bloggers were quick to declare that Obama is the AntiChrist? When it comes to a man who killed 76 fellow "Christians" in one horrific act, the Christian Fundamentalists are silent. Anders Behring Breivik is not labeled as the AntiChrist. No one in the far right "Christian" community dares label this Anders Behring Breivik as the AntiChrist. Why is this? after all Anders Behring Breivik killed with his very own hands more innocent Christians than Obama ever did. The AntiChrist Obama killed no Christians. The Christian Fundamentalist Anders Behring Breivik killed 76 Christians. What gives? Why no more quick finger pointing at an evil man who should be considered an enemy to "Christianity"? Jens Stoltenberg, right, Prime Minister and leader of the Norwegian Labour Party, with his wife Ingrid Schulerud, stands in line to cast his vote in the Norwegian election in Oslo Sunday, Sept. 14, 2009. "Today Norway was hit by two shocking and bloody and cowardly attacks. We still do not know who attacked us; much is still uncertain. But we know that many are dead and injured. We are all shocked at the evil that has struck us so brutally and so suddenly. This night demands much of all of us. And the days that follow will demand even more. We are prepared to face up to this. Norway hangs together during critical times. We mourn our dead, we suffer with the injured, and we comfort relatives. This is about attacks on innocent civilians, on young people at summer camp. An attack on all of us. From The Shari Length of the Beard by Mufti Afzal Elias, May Allah reward him abundantly, aameen. October 31, 2010 Muslim terrorist attack at Our Lady of Salvation, Baghdad Iraq. Muslim attackers yelled "All of you are infidels. We are here to avenge the burning of the Qur'ans and the jailing of Muslim women in Egypt." Muslim attackers were dressed like guards working for a private security firm and also had fake IDs. Muslims terrorists were high on drugs and acting acting insane. The Security Service is responsible for "protecting the UK against threats to national security from espionage, terrorism and sabotage, from the activities of agents of foreign powers, and from actions intended to overthrow or undermine parliamentary democracy by political, industrial or violent means." See"Protecting National Security" for more information on what this means in practice.We also provide security advice to a range of organisations in the public and private sectors, and work against the proliferation of weapons of mass destruction. We have also contributed to the fight against serious crime, though our work in this area is currently suspended. Our statement of objectives and values explains the Service's responsibilities in more detail, and outlines the civic values that we follow in performing our duties. How Successful Is Anders Behring Breivik As An Anti-Islamist? How Sucessful Is Anders Behring Breivik As An Anti-Islamist? 76 white non-Muslims killed by Anders Behring Breivik. 0 dark skinned Muslims killed Anders Behring Breivik. Anders Behring Breivik is a total failure as a anti-Islamist. Agreed? Anders Behring Breivik killed more non-Muslims than your average Muslim terrorist. Do you think that he will win an award from the Muslim Jihadists? If Anders Behring Breivik Is An Anti-Islamist Extremist Then Why Did He Kill Only White Non-Muslims? Fight against those who believe not in Allah, nor in the Last Day, nor forbid that which has been forbidden by Allah and His Messenger. … and fight against those who acknowledge not the religion of truth (i.e., Islam) among the People of the Scripture (Jews and Christians), until they pay the Jizyah (Tax for Jews/Christians) with willing submission and feel themselves subdued. Kill the unbelievers wherever you find them. …But if they repent and accept Islam … then leave their way free. Are these faces the faces of Islam? No. Anders Behring Breivik targeted whites, not dark skinned Muslims. Obvious question why write a 1500 page anti-Islamist screed and then go out and murder 76 whites? Anyone in the media asking this question? Why Would Anders Behring Breivik Attend His Final Martyr's Mass At A Church That Has A Mission To The Muslim Fulani Tribe Of Mali Africa? What gives? Anders Behring Breivik belongs to a church that spreads ecumenism in deepest darkest Africa? Does Anders Behring Breivik put a little somethin' somethin' in the collection plate for such a worthy cause? So let me get this straight Anders Behring Breivik kills his fellow whites and helps Muslims in Mali? I'm wondering why the media has not picked up on this? Hey how many right wing extremists/neo-nazis send money to Muslims in Mali? Go ahead take a guess! Norway's Island Of The Dead: Muslim Convert Or EthnoNationalist? Anders Breivik Kills 92? Any Connection Between The Leiby Kletzky Murder & The Four Alarm Fire Of The Jewish Orthodox Synagogue - Congregation Kehilath Jeshurun, On The Night Of Monday, July, 11th 2011? Anyone question the relation between the two events? A murder & a fire on the same night? Something horrible happen on the night of July 11th. According to Aron's confession to the police, he took advantage of the situation & kidnapped a boy & later tortured and dismembered the boy on the night of July 11th. Where did this horrible crime of torture take place? Did it take place in Mr. Aron's residence or somewhere else? Would it be easier to commit the crime in a location far removed from neighbors and other witnesses? Top floor of an abandon Synagogue is a perfect place to commit such a horrible deed. Were there more persons involved in this killing? Did the police account for all of the blood shed by Leiby Kletzky? "My name is Levi Aron... On Monday (July 11th) evening around 5:30 I went to my dentist, Dr. Sorcher, to make a payment for visit for exam routine. Revenge attack by Muslims. All Muslims are a threat to Western Civilization (or, what is left of Western Civilization). Muslim are so misguided and disturbed by the demented writings of the false prophet Muhammad that they will go to any length to disrupt the peace of their non-Muslim neighbors. Enough of the toleration shown to Muslims. ALL Muslims should be deported back to the desert and left to their own evil devices. Islam is from hell and it is hell that Islam spreads in this world. The leaders of modern democracy have failed to contain this evil force. The west continues to pay in blood split for the lack of leadership shown by our illustrious democratically elected leaders. Our elected leaders have failed us, our elected leaders have failed to defend us. Modern democracy has let this happen. BROOKLYN, N.Y. (PIX11)— Eight days after discovering the remains of 8-year-old Leiby Kletzky in the freezer of Levi Aron's attic apartment, crime scene investigators continue to pull bags of evidence out of the home as they try to determine if Aron killed other children. Aron confessed to police that he murdered and dismembered Kletzky after he met the lost child who wandered off in the wrong direction the first day he was allowed to walk alone from day camp.